Do you have someone new in your life this Thanksgiving? 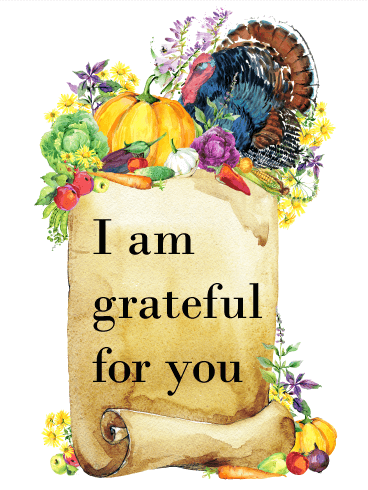 The holiday is the perfect occasion to let them know how grateful you are to have them around, and this Thanksgiving card is the perfect way to do it. 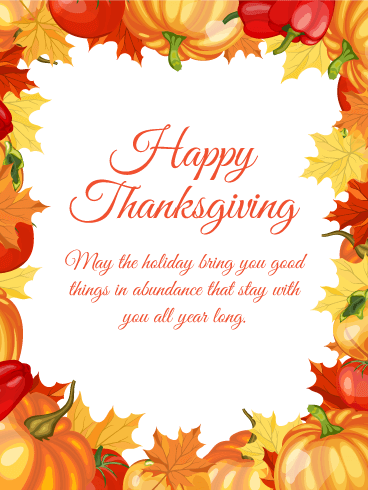 The golden rays of the rising sun shimmer through autumn leaves of red and orange surrounding your message on this Thanksgiving card. Thanksgiving may be just one day, but the warmth and joy stay with us all throughout the year. This Thanksgiving card is a special reminder of that sentiment. Featuring a harvest-inspired frame of vibrant leaves and pumpkins, it carries with it a thoughtful greeting for someone you care about, one that they will take with them each day that follows. It's that time of year again. A time to give thanks and gather around our loved ones. A time to remember our blessings and how far we've come. With warm autumn colors, this Thanksgiving card reflects the abundance in our lives. Golden maple leaves, cranberries and rich, orange pumpkins create a plentiful cornucopia for a sincere Thanksgiving greeting card. Wish a very happy Thanksgiving to everyone you know and feel your heart overflow with gratitude. 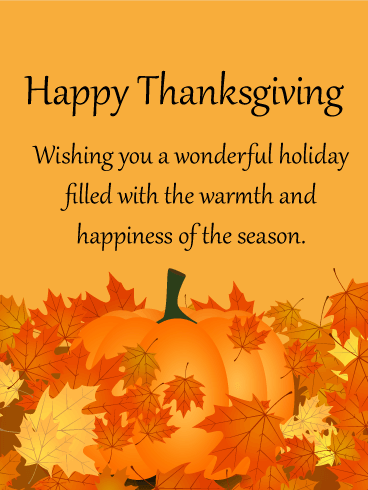 Send all the warmth and happiness of the Thanksgiving holiday season to your family and friends. As the temperatures begin to dip, bring the last of the season's warmth to their hearts with this Thanksgiving card. The last of fall's colors - orange, yellow, and red - are a stunning statement about the beauty of life and a reminder to be thankful for it. 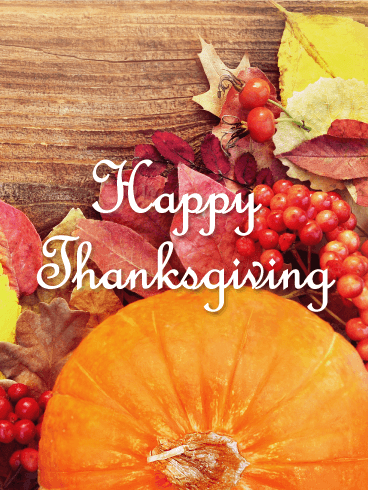 This beautiful Happy Thanksgiving card will add joy to your friend's day! It features bursts of light that sparkle around the colorful maple leaves, a spectacular sight to see! The yellow background makes this Thanksgiving card complete by giving it a bright happy look. 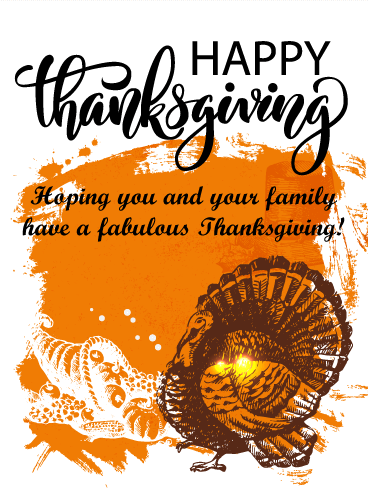 The message is perfect if you would like to let your friend know that you are thinking of them this Thanksgiving season, a good reason to send this exquisite card out to all your friends today! Looking for a fun card to wish your friend a Happy Thanksgiving, this one will certainly do the trick! The cute turkey peering out from the maple leaf will be sure to put a smile on your friend's face. 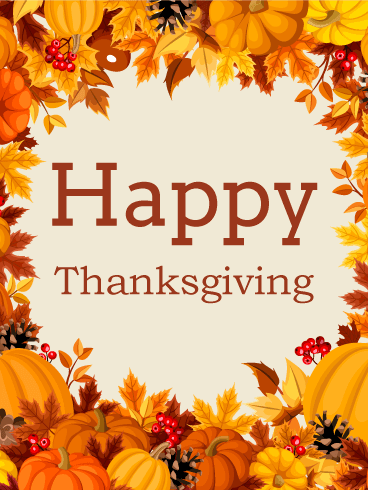 Plus, the thoughtful message wishes your friend and his or her family a Happy Thanksgiving. The perfect Thanksgiving Day card indeed! Send this little Thanksgiving turkey on his way, he wants to wish your friend a fabulous day. A simple card that says so much, this Thanksgiving card wishes everyone a happy Thanksgiving. The beautiful background features a close-up picture of a Thanksgiving table centerpiece of a pumpkin, cranberries, and fall foliage on a dinner table. The script message beautifully carries your Thanksgiving greetings to your loved ones. This Thanksgiving card will fill the receiver's inbox with the joy of the season. Every day that passes is another day that you are grateful for them, and Thanksgiving is the perfect chance to let them know that you are grateful. 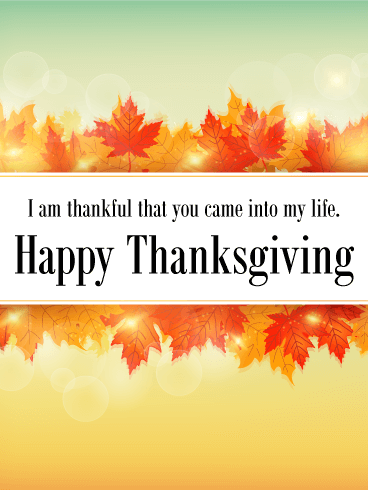 Let your family and friends know how you feel with this Thanksgiving card that states it simply and perfectly. A scroll featuring your message is surrounded by all of the harvest bounty that Thanksgiving is known for. Pumpkins, Pilgrim's hats, acorns, and maple leaves, this is definitely a Thanksgiving Day card! It features many fall colors and traditional Thanksgiving icons that make this classic Happy Thanksgiving card great for sending off to that special friend of yours that you care about so much! It will let your friend know that you are thinking of them this Thanksgiving. Tradition is the hallmark of the Thanksgiving holiday, and this vintage card echoes the feeling of history that marks the occasion. Wish your friends and family a fabulous celebration with this Thanksgiving card that features a cornucopia and turkey, two classic symbols of the holiday that will remind your loved ones you are thankful for them. The festive harvest orange background reminds us to be thankful for the bounty in our lives. 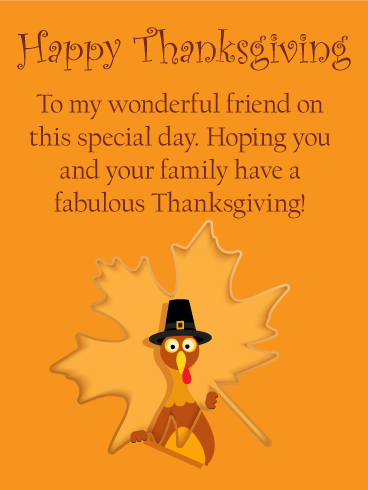 This exciting Thanksgiving card was created specifically to wish your awesome friend a Happy Thanksgiving! It's bursting with color and will bring cheer to your friend's day. It features a traditional pilgrim's hat and maple leaves, giving it that Thanksgiving touch. 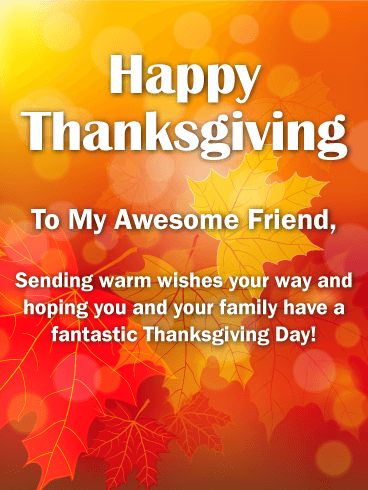 Wish your friend a fantastic Thanksgiving Day by sending this great Thanksgiving card out without delay! Wish your friend a Happy Thanksgiving with this cheerful vibrant Thanksgiving card. They will be so happy you took the time to send it their way. It will show them how much you care! It features colorful images of pumpkins, sunflowers, and other traditional Thanksgiving items. 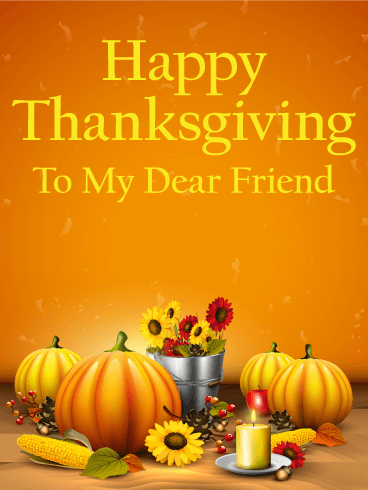 So send this Thanksgiving card out today to wish your friend a Happy Thanksgiving Day! This Thanksgiving be sure to let your closest friends know how thankful you are to have them in your life. This Happy Thanksgiving card would be a much appreciated sentiment. Its elegant design and touching message will certainly warm the hearts of your friends. It contains everything you need to wish them a Happy Thanksgiving; a colorful turkey, maple leaves, pumpkins, and more. Your friends are waiting, so send this beautiful Thanksgiving card out today.